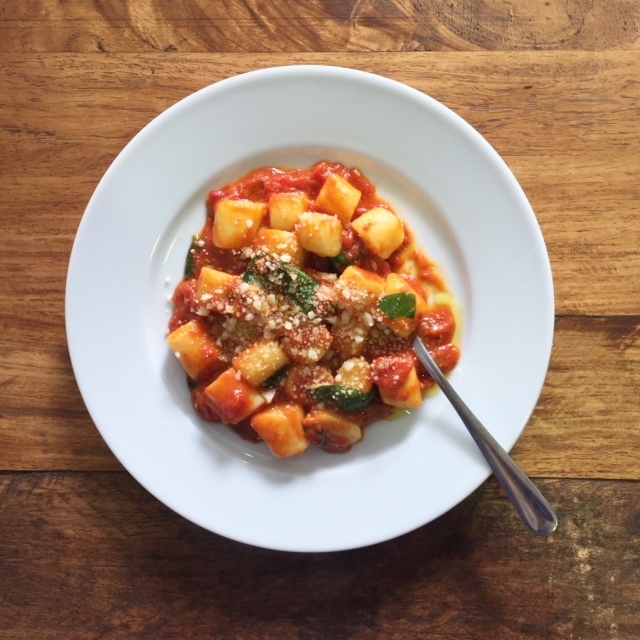 After 21 highly successful weeks feeding our loyal customers pasta, gnocchi and polenta cooked from the heart, we have decided to call time on Il Tavolo – Thursday dinners with David. The decision was tricky but came from good places – family mostly. David has a new born son and hours spent rolling, cutting stirring and grating will now be a little more confined to café hours so he can get home for bath time. Fear not though – for where there are endings there are always new beginnings. Where Il Tavolo dinners left off, Il Tavolo take home meals pick up. Starting, like, now – our house made pasta sauces and take home meals will be readily available across the counter at the café. David will be cooking whatever takes his fancy at the time but you can expect, at any given time, sausage ragu, bolognese, spicy tomato sugo, slow cooked zucchini with mint and pecorino, perhaps gnocchi and occasionally lasagne. There’ll be dried pasta to suit and perhaps a wedge of cheese should you need it. If you're in town for a weekend of R and R then come and see us, we'll sort you out. Further to that – ‘Focaccia Friday’ is a thing. There will still be focaccia on the pass every day for your enjoyment now that the weather has warmed enough for the dough to prove – we missed it too. But the Friday thing – that’s all that and a bag of chips! Place your order with us by close of business (3pm) on Wednesday and you can have you own slab (full, half, quarter) of David’s freshly baked focaccia to take home for the weekend. Perfect of course with your pasta Friday night, still awesome Saturday – and perfect gently warmed or toasted to mop up the eggs on Sunday morning. Orders can be placed by emailing us at food@100miletable.com. Focaccia Friday kicks off Friday September 7. Thank you for your support of Thursday dinners over the last 5 months or so – there will of course be pop ups from time to time so stay tuned – and we look forward to seeing you at the café to pick up a jar or 2 of something delicious and a loaf of goodness. If you're in town for a weekend of R and R then come and see us, we'll sort you out. Take home meals in Byron Bay - let's do this thing!